Within the context of the fourth FIBER Festival edition (May 11-14), FIBER and De Brakke Grond host the nomadic Choreographic Coding Lab. The Choreographic Coding Lab (CCL) is an internationally travelling format offering digital media artists the opportunity to translate aspects of choreography and dance into digital form and apply choreographic thinking to their own practice. From Saturday May 6 till Wednesday May 10 a selected group of artists, dancers, creative coders and choreography experts will be working on projects and ideas relating technology and the moving body at De Brakke Grond. In a one-week interdisciplinary peer-to-peer setting, the participants work on their own projects, share knowledge, find new collaboration partners, discuss ideas and challenges. 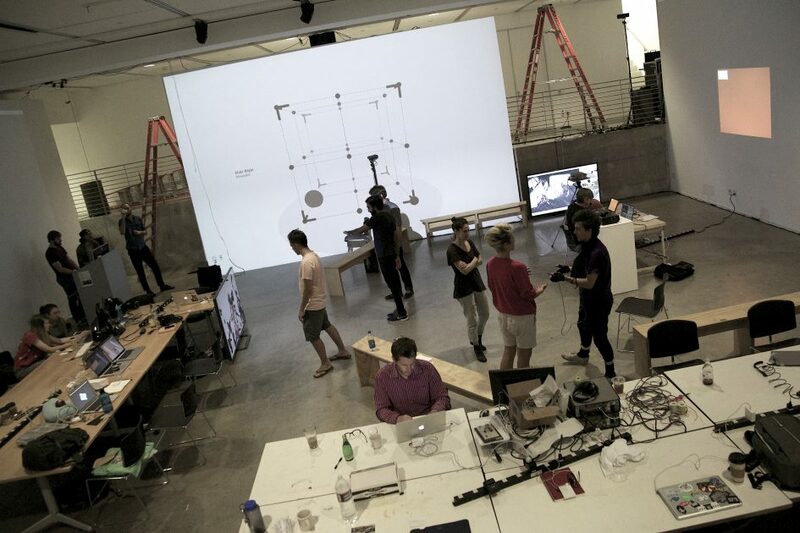 The CCL series is an outcome of Motion Bank (motionbank.org), a four-year research project of The Forsythe Company focused on the creation of digital dance scores with guest choreographers. This research involved the study, documentation and analysis of unique choreographic approaches. The datasets and tools used behind the development of the Motion Bank scores will be made available for the CCLs. For the 8th CCL, the choreographers Eric Minh Cuong Castaing, Andrea Bozic, and Arno Schuitemaker will participate in the lab and give insights into their choreographic work. In addition, Suzan Tunca (ICK Amsterdam) will share choreographic thinking input by Emio Greco | PC. This year, the lab is open to 30 participants from around the world and is combined with a public programme: an open lab session sharing the outcome of 5 days of prototyping and experimenting, with a series of short presentations and panel discussions, within the FIBER Festival Conference. On Monday 8th & Tuesday 9th May, two guided tours will take place at de Brakke Grond. The Choreographic Coding Tour brings you right into the heart of the ongoing Choreographic Coding Lab. You will meet the organisers, a few participants and you’ll have a peek into the lab. On Wednesday 10th May, the participants will share their work in progress and the lab outcomes during an Open Lab Session. Attending this open session you will have the opportunity to learn more about the artistic practices that evolved between the artists and coders and pose your own questions to the makers.